6-7:30 p.m. Contact commteam@k12.wa.us for translation services. November 2018 marked the inaugural year of MTSS Fest, hosted by the Office of Superintendent of Public Instruction in partnership with the National Center on Intensive Intervention. Planning committee members included Glenna Gallo (OSPI), Dixie Grunenfelder (OSPI), Kelcey Schmitz (OSPI), Tania May (OSPI), Lee Collyer (OSPI), Robin Howe (OSPI), Sarah Arden (NCII-AIR), Bill Rasplica (NCII), and Shiloh Kauzlarich (CRESD 113). The Conference offered two full days of learning, including daily keynotes, 37 breakout sessions, and team time for groups to connect and share. A Monday evening reception, sponsored by Kaiser Permanente, hosted opportunity for attendees to network with presenters and each other. MTSS Fest was a huge success; showing us how much statewide support is desired. Registration sold out in less than two weeks. A conference imagined for 300-350 individuals brought over 400 participants statewide. Presentation materials from MTSS Fest 2018 can be found here. 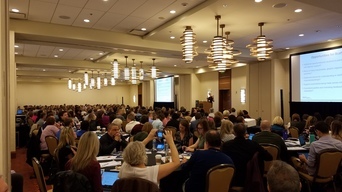 As a result of the success of the recent conference and large wait list, OSPI, NCII, ESD 113, and other partners are planning "MTSS Fest East" in Spokane in the spring of 2019. If you would like to be notified about future MTSS events you can sign up for alerts here. Washington Educational Research Association (WERA) is excited to launch a free webinar series call "Hot Topics". The "Hot Topics" webinars occur 3-4 times a year specific to relevant education issue and/or highlight WERA Offerings that will be of interest to members. 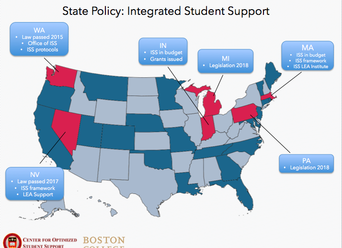 Written by Joan Wasser Gish, Director of Strategic Initiatives, Center for Optimized Student Support, Boston College, Discusses Integrated Student Supports in Massachusetts and Other states.